To celebrate my recent birthday, my wife and I traveled to Canada. 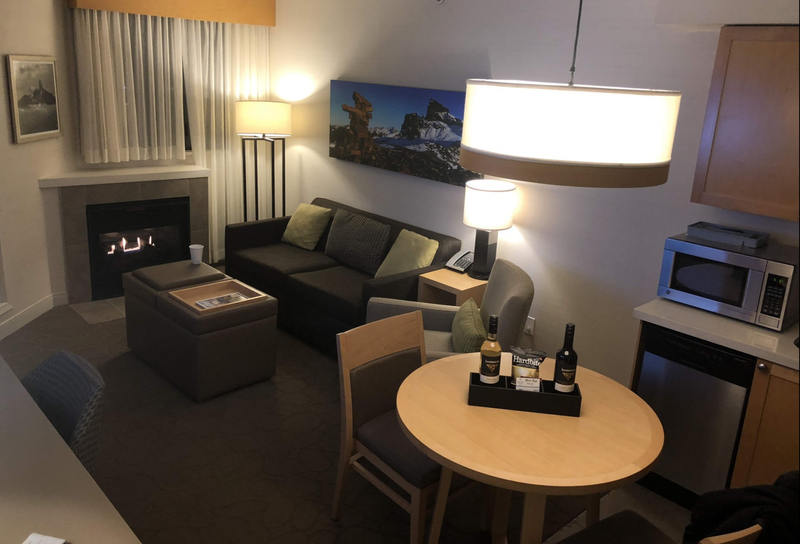 And thanks to a very generous gift from a friend of ours, we got to enjoy 3 free nights at the Delta Hotels by Marriott Whistler Village Suites. The good news is, you can book this same hotel for just 35,000 Marriott points per night. The hotel is a short walk from the mountain and next to Whistler Village, so booking an award stay at this hotel can be a phenomenal deal! Plus, Marriott is a Chase Ultimate Rewards transfer partner. So you can earn points with cards like Chase Sapphire Preferred® Card and Ink Business Preferred℠ Credit Card. Then, transfer them directly to your Marriott loyalty account at a 1:1 ratio. Or you can earn Marriott points directly with a card like the Starwood Preferred Guest® Credit Card from American Express. According to a 2018 Condé Nast Traveller ranking, Whistler, Canada ranks #2 on a list of the world’s best ski destinations. 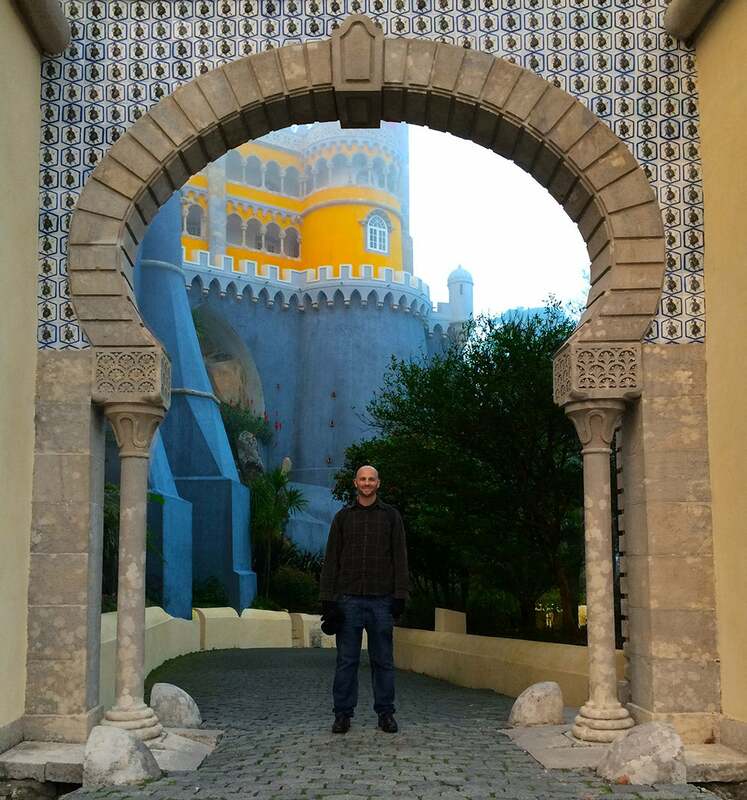 So I was thrilled to have an opportunity to visit the area. Late-November can be hit or miss in terms of ski conditions. And unfortunately, it was a miss this year. It was mostly rainy, which wasn’t ideal for the one day we got to ski. However, we still had a blast exploring the village area and enjoying a day at the spa. 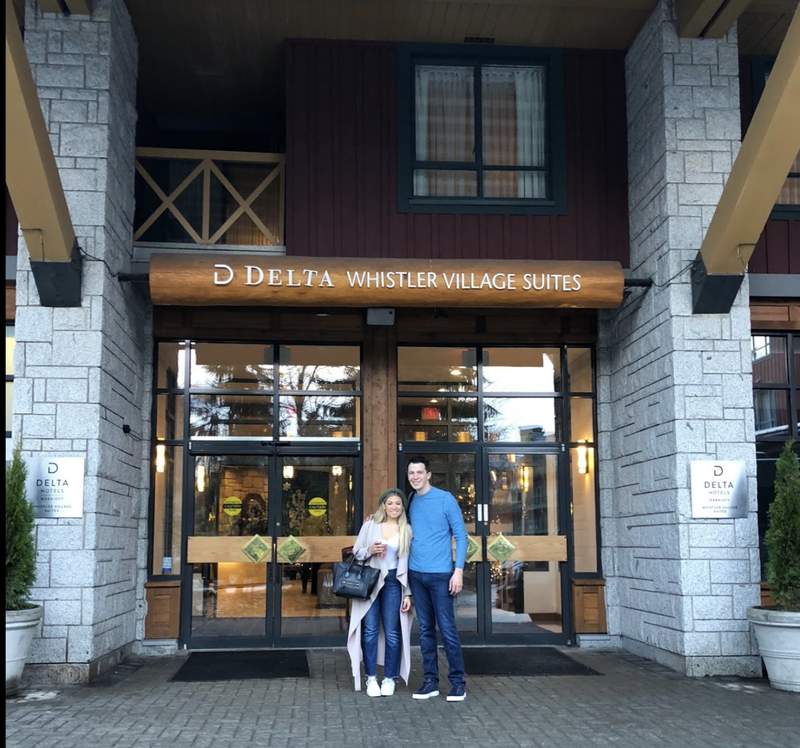 You Can Book Free Nights in Whistler, Canada at the Delta Whistler Village Suites for Just 35,000 Marriott Points per Night! In Whistler, the only other options for using Marriott points is The Westin Resort & Spa, Whistler, which costs 60,000 points per night. 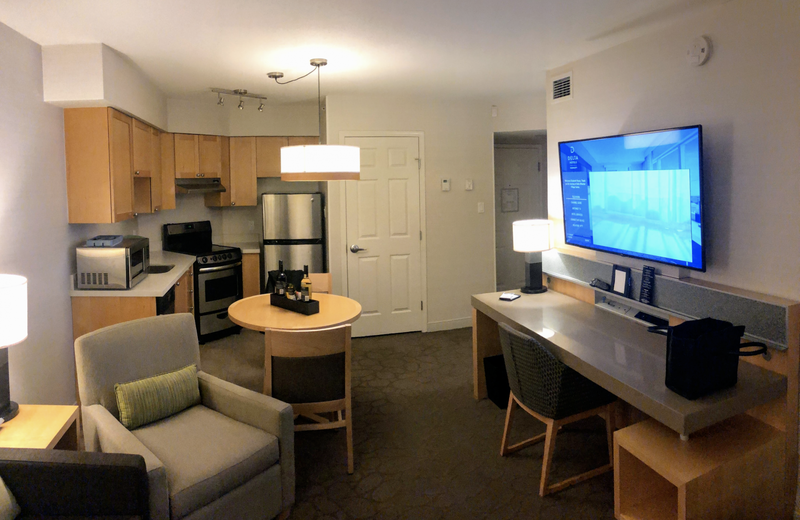 So if you’re thrifty with your points, the Delta Whistler Village Suites is a much better deal! Whistler is about a 2-hour drive from the Vancouver airport. So my wife and I used Alaska Airlines miles to fly from Los Angeles to Vancouver. The ~2 Hour Drive to Whistler Is Extremely Scenic! As part of the travel package our friend gave us, shuttle service was included through Ridebooker. This is a shared shuttle, similar to Super Shuttle. A round-trip shuttle costs ~$110 per person. 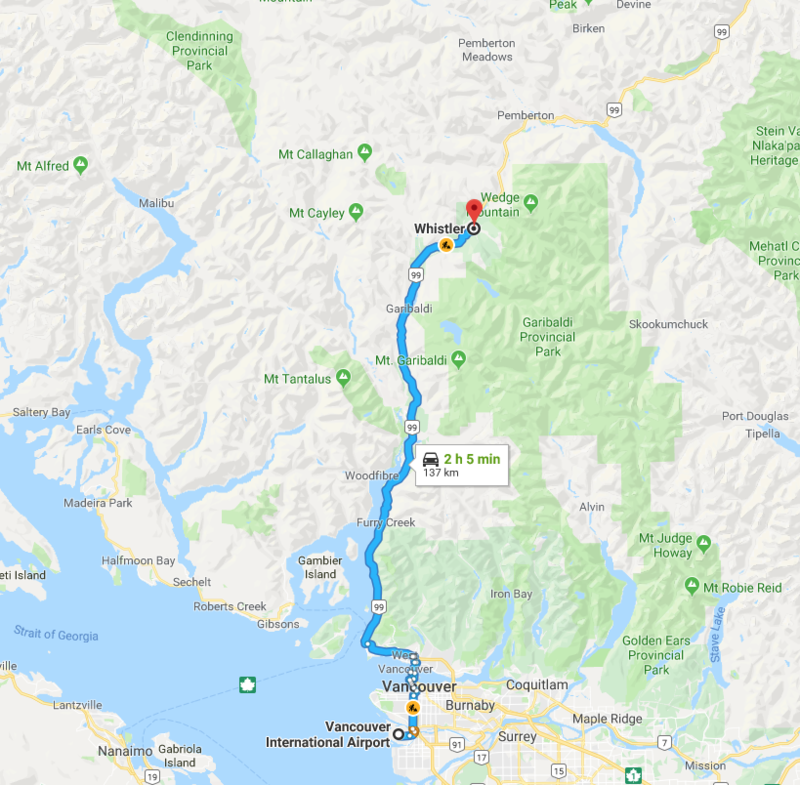 You can also get to Whistler by using one of the 3 bus services that operate between Vancouver and Whistler, including Greyhound, Pacific Coach, or Snowbus. Or you might consider renting a car. If you rent a car, be sure to check out our guide to avoid overpaying for your rental car! I typically like to save my points and use them to book luxurious stays at top-rated hotels. 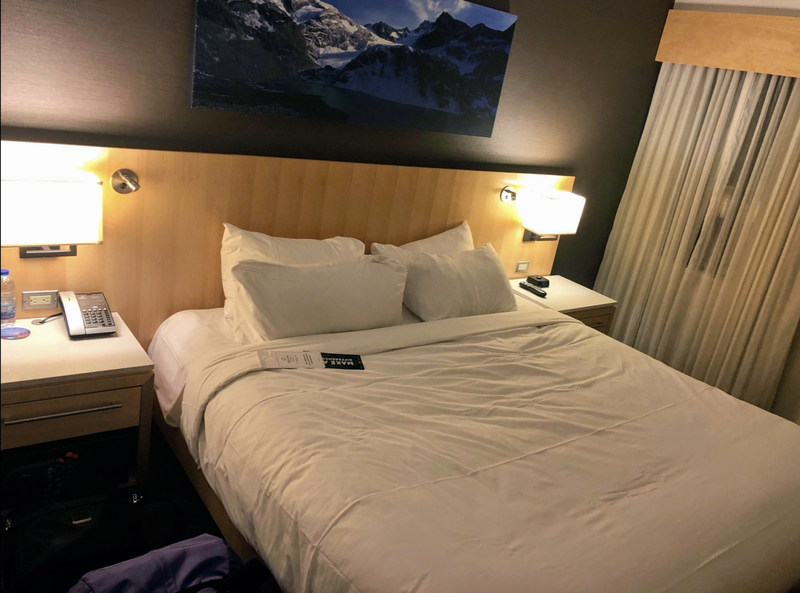 But staying at the Delta Whistler Village Suites was a terrific reminder that you can have a fantastic stay at lower level hotels. So going forward, I’ll definitely explore all category options when redeeming points. Because booking cheaper award stays means using fewer points. And that means having leftover points to book more travel! Plus, between skiing, shopping, and exploring Whistler, we didn’t spend much time at the hotel. It’d be different if we were going on a beach vacation and spending most of our time right at the hotel or resort. Then, I might consider using more points to splurge on a luxurious hotel stay. The Delta Whistler Village Suites is a Category 5 Marriott hotel. So a free night costs 35,000 points. Remember, you can get a 5th night free when you book award stays at Marriott hotels. So you could use 140,000 Marriott points for a 5-night ski getaway. As a comparison, nightly rates at this hotel can cost $160 to $350, depending on your travel dates. 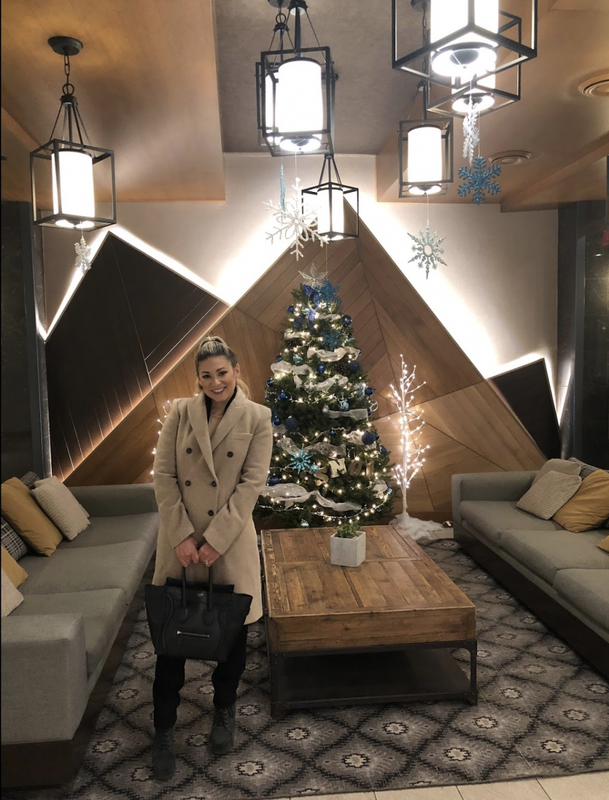 The Lobby in the Delta Whistler Village Suites Was Very Festive During Our Late-November Stay! The ski lift and gondola at the entrance to Whistler Mountain are less than a 10-minute walk from the hotel. Plus, the hotel offers a complimentary shuttle service to nearby destinations. 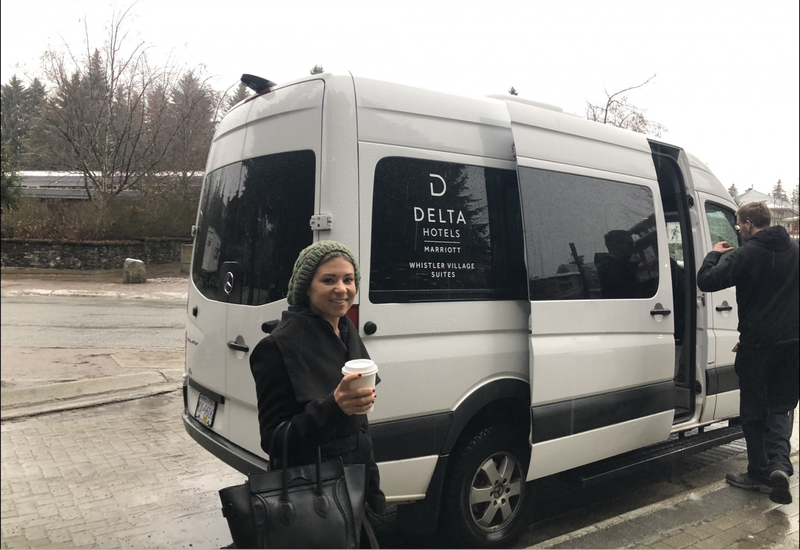 For example, my wife and I took the shuttle to Scandinave Spa Whistler. 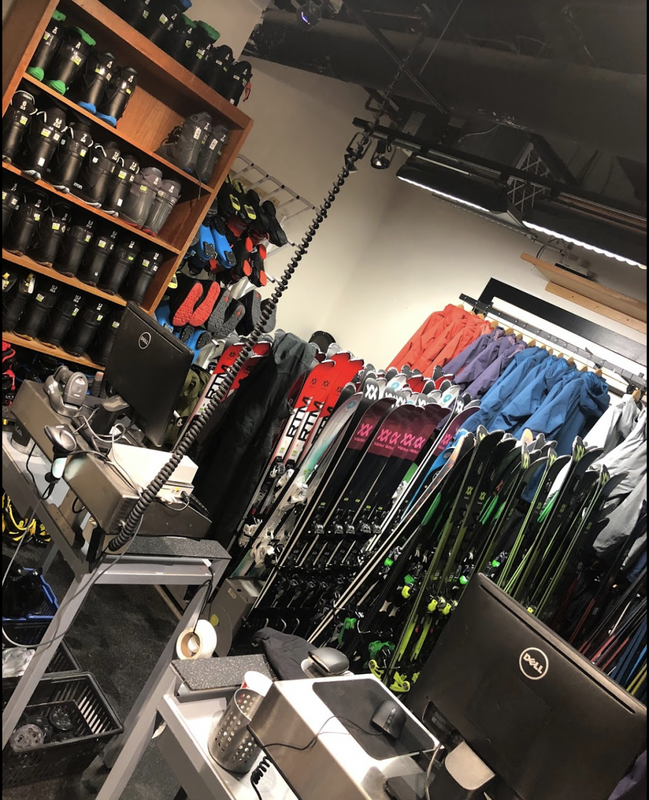 There is no shortage of ski rental shops in Whistler. But the hotel has a rental shop on the ground floor, which is super convenient. My wife and I decided to rent gear on this trip because we were only skiing and snowboarding for one day. Overall, the room was everything we needed for our stay. The 1 bedroom suite room type had a living room area and kitchenette, bedroom and bathroom. Here’s the living room area from a different angle, which highlights the fireplace. The bedroom was a bit on the smaller side, but there was plenty of room throughout the rest of the suite to store our bags. And no ski resort hotel would be complete without a heated pool! 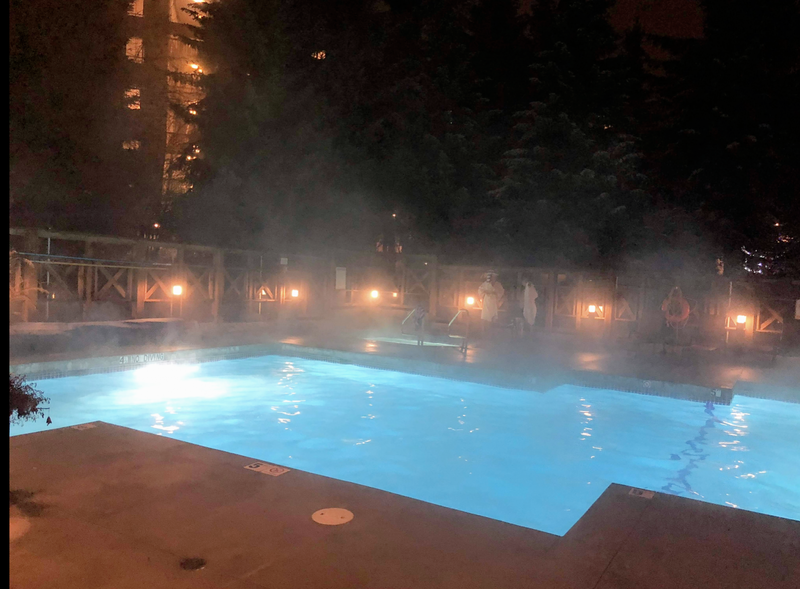 Jumping in a Heated Pool or Jacuzzi After a Day of Skiing Is a Must! 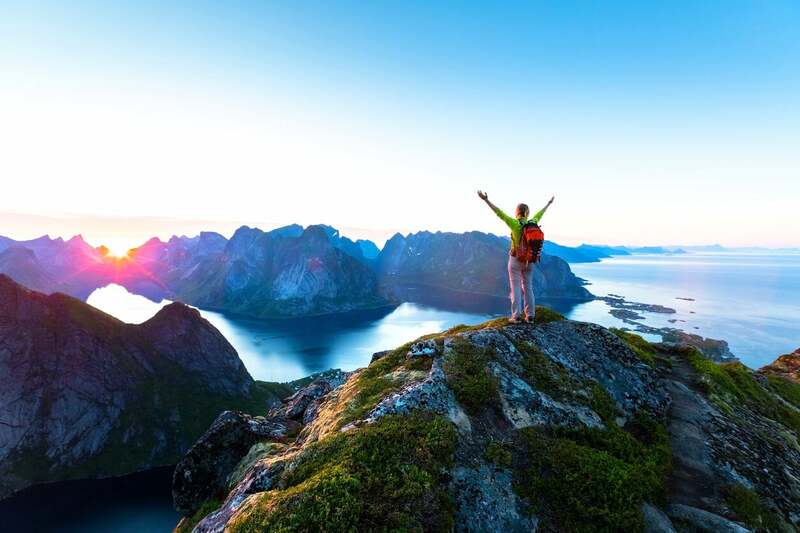 Be sure to check out our guide highlighting all the ways to earn Marriott points! Have you been to Whistler? Or any plans on traveling there this winter? Let me know in the comments below! 10:22 amDecember 8, 2018 J. D.
We visited during Thanksgiving and stayed at the Delta! I loved the lobby and the ski shop downstairs was so convenient. All of the employees there were so friendly and helpful. Loved our time there! We must have just missed each other by a few days! I agree – the employees were extremely friendly! Would love to go back later in the ski season or next year!